The season’s barely begun, right? Technically we’re already one sixth of the way through the 2017 season and with a pause this week given the vanishing of the Tour of Qatar and the Tour Méditerranéen it’s a good moment to take a look at the standings so far. 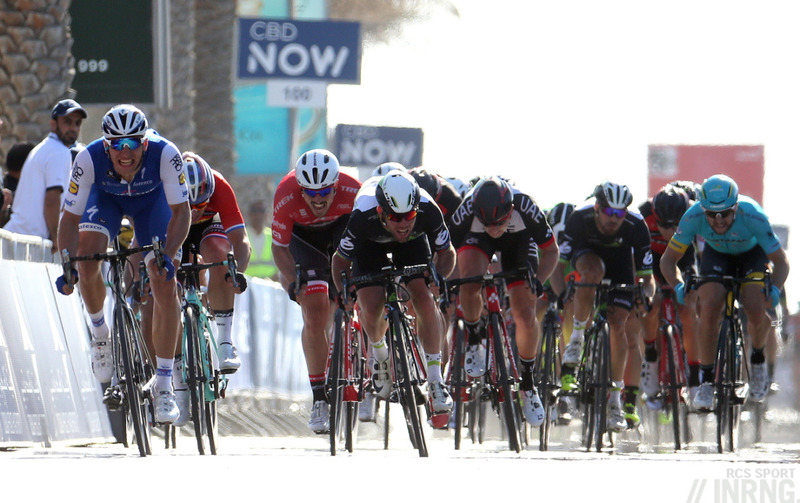 Quick Step step quickly to the top of the table with 10 wins from five riders. Over the years the team consistently won races with many of their riders, last year 18 of their 30 riders took individual wins, ie excluding team time trials. The Belgian team is off to a lucky start this year too in terms of podium distribution with 10 wins and only one second place and one third place. Orica-Scott are on seven after enjoying Australia’s “summer of cycling” thanks to Caleb Ewan’s four stage wins in the Tour Down Under and two from Damien Howson in the recent Herald Sun Tour, a good win for a rider who has until quietly impressed as a mountain domestique. Magnus Cort Nielsen’s picked a win in Spain already, carrying on from his Vuelta stage wins last year. BMC Racing are third thanks to a double at the Australian nationals where Rohan Dennis and Miles Scotson won titles and then Richie Porte’s two stage wins and the overall classification in the Tour Down Under add to the tally. Porte is looking like a contender for the podium in the Tour de France but his triumph Down Under isn’t behind this, instead it’s his record in races like the Tour itself and regular wins in Paris-Nice that earn him podium contender status. Lotto-Soudal have enjoyed a nice start to the season with two wins in Majorca and Tony Gallopin took a time trial win in yesterday’s final stage of the Etoile de Bessèges, his first in a time trial and perhaps a sign of the raw power he’ll need as he switches his focus towards the cobbled classics this year when in recent years he took aim at the Ardennes races. Tim Wellens took two wins thanks to his explosive, daring ways and aided by team tactics with his squad able to mark out rivals. Among the others FDJ and Team Sky are tied on three wins but different stories as FDJ have seen two of their three leaders win in Arthur Vichot and Arnaud Démare while Team Sky have seen three domestiques enjoy a rare win, even if Luke Rowe and Ian Stannard are classics contenders in the spring too. 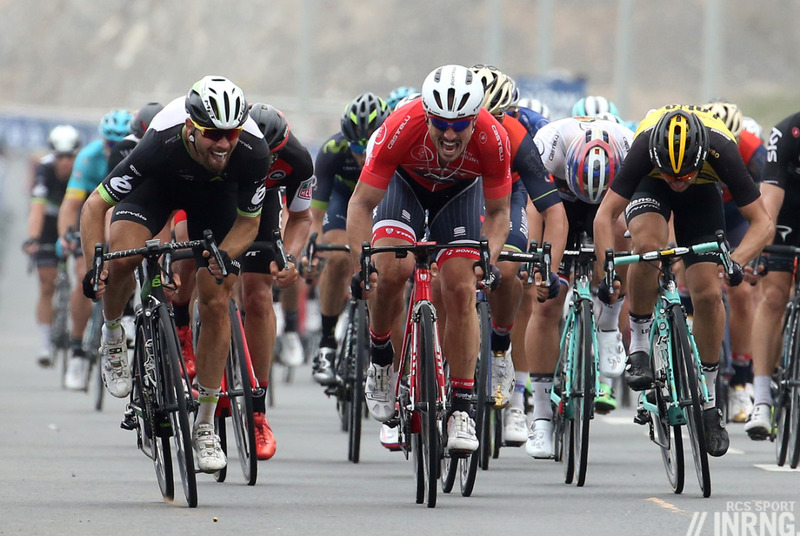 Trek-Segafredo have two wins, a pleasing sprint win for Degenkolb to show his recovery from that training crash a year ago and an intriguing win for Bauke Mollema in the Vuelta San Juan. The Argentine race had a bantamweight start list but it was the manner of Mollema’s win that impressed, he almost won the time trial stage and it’ll be interesting to see how he fares this year given he’s notionally second fiddle to Alberto Contador. 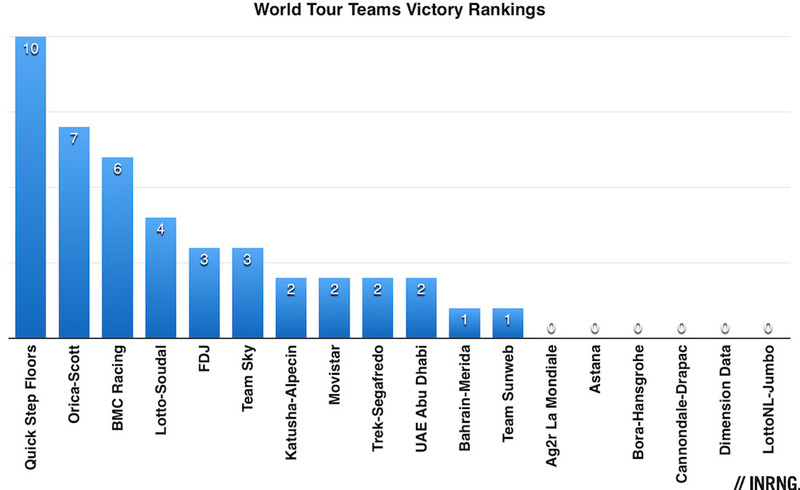 The chart includes the teams without a win if only to remind us of all 18 teams in the World Tour. 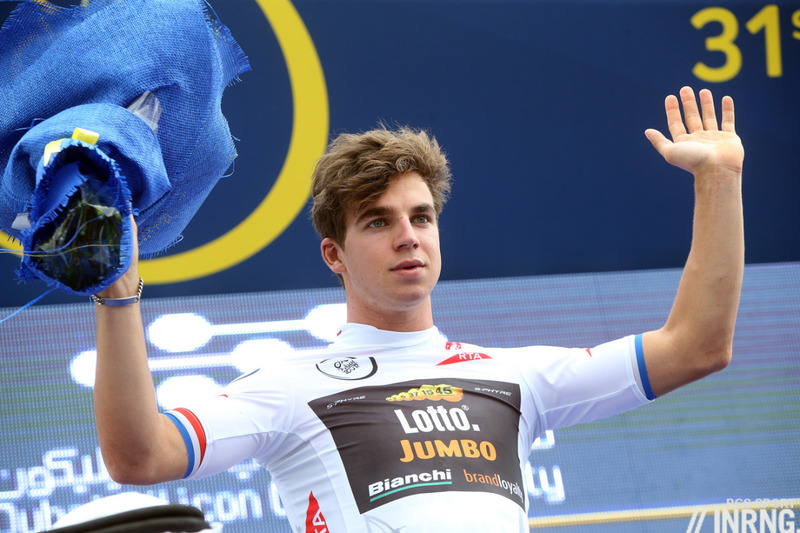 Lotto-Jumbo are all in behind Dylan Groenewegen for wins and they’re bound to get off the mark with the 23 year old Dutch champion who has beaten the likes of Marcel Kittel and André Greipel in straight sprints. Bora-Hansgrohe are waiting for that first win, Sam Bennett came close already in Australia but all eyes are on Peter Sagan. Remember that until he won Gent-Wevelgem last year the story was all about how the Slovak simply couldn’t win a race rather than the nonchalant ease he went on to display for most of the year. Dimension Data were almost relegated last year but won’t suffer on the victory rankings with a sprinter like Mark Cavendish. Astana have lost their sprinter Andrea Guardini but recruited neo-pro Riccardo Minali who has yet to win but has started well and if the name is familiar to some, it’s because his father was a prolific winner in the 1990s. Ag2r La Mondiale and Cannondale-Drapac are the two that might need more time. The French team doesn’t have a house sprinter and Nico Denz’s mountains jersey from the Etoile de Bessèges doesn’t count as a win but they’ve had two podium places already. The US team has a sprinter in Wouter Wippert but he hasn’t won since June 2015 and the team has yet to have a top-three finish. We might be some way through the season but there are slim pickings for the second tier of teams who have just three wins between them, an obvious sign of the dominance of World Tour teams. Direct Energie took two wins yesterday to propel to the top of the chart thanks to Lilian Calmejane and Bryan Coquard. Fortuneo-Vital Concept have a win thanks to Dan McLay and United Healthcare scored in the Herald Sun Tour with sprinter Travis McCabe. In each case having a sprinter on the roster is good for the wins. But absent from the list so far are Cofidis where Nacer Bouhanni has two second places and a third. Does a winning start bring success for the rest of the year? There’s the hypothesis that a successful start to the year allows teams to look ahead to the rest of the season with confidence, that success breeds success and those teams struggling begin to get nervous and risk being stuck in a rut. This blog’s done the maths and the correlation between early wins and success over the whole season seems weak but it’ll be worth revisiting the topic again soon with fresh data from 2016 because at first glance last year seemed to suggest a good start did help. 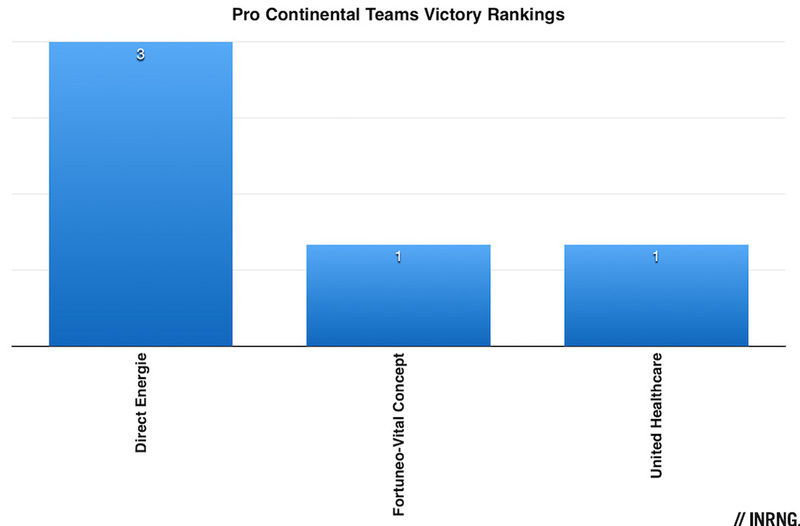 Team victory rankings methodology: all World Tour, HC and *.1 races count as well as national championships. A win is a victory in a one day race, a stage victory or the overall classification in race. Annex competitions like best young rider, the points prize or a mountains jersey don’t count. Technically we are one sixth of the way through the season, there have been 67 days of racing so far out of a calendar of 435 days of racing. But this is because the UCI starts the new season the day after its annual “gala” held in mid-October last year. So any race taking place after this awards ceremony is formerly part of the 2017 season (UCI rule 2.1.001 in case you need to know). However the rankings displayed on this site are for the calendar year because this is when each team is formed: there’s no point having a set of rankings for teams that have changed composition along the way. This points to the continual absurdity of a season that is defined in opposition to the registration of teams and rider contracts. Quick step always seem to top this ranking. Am I right in thinking they don’t have a sponsor lined up for next year? I had a look and you have to go back to 2011 when they didn’t have the most wins in a year, it was HTC Highroad then. No sponsor has been named but the team owner, billionaire Zdeněk Bakala has said he’ll keep the team going. Without Boonen it’ll be interesting to see their appeal to the original Belgian market, the rest of the team is very cosmopolitan these days. I like to look at Inrng’s team victory updates and compare them to PCS’ / WT rankings, which both show QS to be far from as dominant. But such is the overall strength of their squad that QS consistently take a lot of HC and especially .1 race victories. Dimension Data might have no wins yet are ranked 7th PCS and 5th WT. Best victory of the season to date, for me, was a rider who can still step quickly, thank you very much, Tony Martin. Are we all cheering for Katusha this season? Yes, that was a nice one. Tactically succesful, too. Although it was (and it will probably be for quite some time) a bit strange to see Tony Martin ride in red. The last comment is really interesting. Probably would merit endless discussion on victory rankings vs other system of rankings (i.e. PCS & UCI). My take on this is the most important for teams is victories as this is probably the only thing the general public sees and reads. Therefore most important in terms of sponsor exposure but conversely excludes most riders. Ranking systems such as PCS & UCI perhaps more interesting from athlete and organization point of view as this incorporates more lower placed rankings which is mostly ignored by the media (for example nobody practically knows of the exploits of Haimar Zubeldia despite him having multiple top 10 finishes in Grand Tours). Still a limitation of this ranking is putting equal value to world tour, HC and .1 races. Some races despite top flight are more or less important depending in various countries, e.g. Tour Down Under is important in Australia but mostly regarded as warm-up elsewhere. Tour de France certainly has outsize influence as demonstrated by most people making the case for Dimension Data with their 5 stage victories while fighting relegation at the World Tour level. My takeaway is no ranking system will accomodate all this nuanced variations, and different purposes are better suited for one or another ranking. Each system have their own winners and losers. Very much agreed with the general point, and I’d also dare to say that in cycling this sort of rankings never mattered very much – and long may that continue being the same way!, even if I’m very afraid that things they are at changin’, because of different markets, different fan cultures and so on. Cycling, comparatively speaking, is a pretty much narrative and historical sport more than a computational one. A sport of *mythos* in its etymological sense. I could name a whole lot of riders whose visibility both in the short and in the long term isn’t that related to their *scores*. Besides this “philosophical” aspect, cycling pragmatic reality implies that a very different share of visibility can be attributed to the same “numerical” result – and the latter is more or less the only thing which fits stats. Is Nibali’s lone attack in 2011 Lombardia proportional to his 40th final place? One might say, “uhm yeah, that counts and works as a normal breakaway”… but is that the same of the typical morning breakaway? The image impact, both on the spot and in shared memory, is probably only second to Zaugg’s victory. In mere quantitative terms, you can come 4th in a GT’s final GC with a hugely different exposition… were you always in the mix with the best or were you the first of those who came in later? Did you grab your top spot with some long solo attack in a decisive moment, even if you were generally inferior, or resisting in the back of the selected group, or thanks to a couple of morning breakaways which got the green light? Different quantity of minutes on TV, in a different moment of the stage (meaning more or less spectators). All that counts a lot, for the sponsor. The effect of an ITT is totally different than a mountain-top finish’s, and a single sprint isn’t worth a good “normal” stage – you must collect several of the former kind, winning a single sprint in a 3 weeks race might even be “a bad result” depending on who you are. Yes, that’s another thing which greatly matters for the sponsors both in quality *and in quantity* terms: different racing actions make the news a whole different way. The morning break receives TV coverage before being reeled in, but it’s less and less present in news reports. A list of names, if anything, which the readers hastily skip. A daring attack from the selected group can make great TV, when seen live, but it might not even enter the video highlights (depending on what else actually happened). OTOH, on a written source it’s easier to be noticed if you make a final good result than if you try an attack and then slip behind. “Victories” are not the only thing the general public sees and reads – and not every victory is seen or read about by the public. A huge lot of races aren’t visible or aren’t covered. Hesjedal and Kruijswijk didn’t win stages in the 2015 Giro, they didn’t even wear a jersey, but I’m pretty much sure that they both were WAY more visible then their teams’ multiple winners, that season (Dombrowski in Utah, Slagter in Alberta, Navardauskas in Lithuania and the Sarthe; Hofland in Yorkshire and Ster ZLM). PS Curious narrative factors: I think that, to say the truth, Zubeldia might be one of the most famous 8th placers in history… everyone ends up speaking of his invisible riding style, from time to time, through at least three different linguistica areas (English, Italian, Spanish). You become famous because everyone thinks you’re less visible than expected! Did the rankings “never” matter much? There are stories of, e.g., Simpson and Poulidor marking each other out of contention in the 1963 Lombardia because they were more concerned with their rankings in the Super Prestige Pernod. And arguably Liege owes its position as a Monument to its inclusion in the Desgrange Colombo challenge. I can see that they certainly started to matter much less as riders became more specialised, and the top tier rankings (whether World Cup, World Tour or otherwise) expanded beyond the main races. Agree with your other points about the difference between finishing position and memorable performance. I’m afraid there might be a linguistic problem, here. The current situation has seen a clear decline of the “competition” part, and now the WT looks like… a ranking (in the sense I was thinking about). I think this website is the best source for news and breakdown of the pro peloton. I’d like to see this breakdown include the podium (top 3) as opposed to just winners. I would assume that the majority of podiums would be World tour athletes. Cannondale-Drapac carrying on from where they left off last year. I like Vaughters, McCarthy has potential, and Dombrowski comes across very well, but they have to do better this season. Uran came close to a few one days wins last year, but he hasn’t really got the kick for those, or staying power for GTs. I think you meant Hugh Carthy. Good rider, lots of potential, but only 22 and needs to prove he has the stamina to deserve a place on a GT roster. Sorry, yeah, I meant Carthy. Also, have LottoNL-Jumbo made any signings to support Kruiswijck in the GTs? He was so strong at the Giro it seems a waste for him to stay there if they only bother with the sprint train. Stef Clement will be a useful recruit, he joins from IAM and is a good lieutenant in the mountains but this is a lower budget team. We’ll see what Jurgen van den Broeck does too. Fair point on the budget, I hoped post-Sep Vanmarcke they would realign to accommodate Kruiswijck. Seems like they’ve done that. I didn’t realise they’d signed Jurgen Van den Broeck! Feels like he’s been around forever and only a few years since he was pushing top 10s in GTs. It’d be good to see Kruiswijck have another tilt at the Giro. You skipped one of the teams with two wins. A mistake or by intention? More than one (UAE Abu Dhabi and Movistar), I didn’t want to comment on every team. Orica-Scott supplement themselves nicely with their womens team, who’ve garnered 5 wins (from about 8 opportunities). The whole collection at Orica making the most of the late Aussie summer and it’s local riders really targeting these events. Quickstep doing well, and have a mix of quality with that quantity. For now at least, it’s a winning team but they could do with some more wins in the big classics for all the hype the team generates. Other teams will bag few wins but big ones. And some will go for the ranking points over the single stage risk. Would be good to see Wins/per race day, although granted that probably takes some extra effort. Quickstep have been active and winning, but is that because they’ve raced more than some other squads? Would be less impressive to win 10 out of 40 than 3 out of 10, for example. It will be interesting to see at the end of this season whether the new World Tour races and accompanying points re-jig produce something approaching a meaningful result that resembles most people’s impression of how the teams went. Hopefully it’s not a situation like last year where Dimension Data racked up the wins but finished dead last, while Cannonade Drapac managed 8th spot despite their merge 8 wins thanks to some high placed finishes. Most people’s impression? 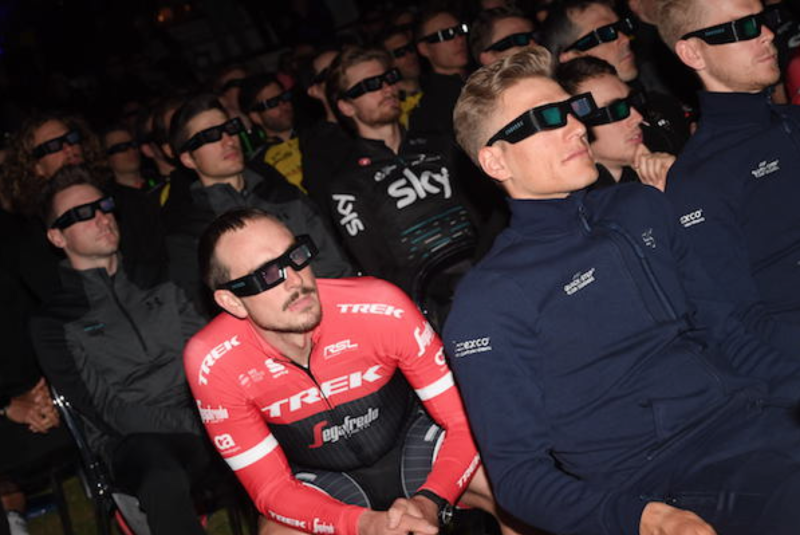 Dimension Data’s drama was an anglophone one, a huge quantity of cycling fans (remember that most of them are still Flemish, Italian, French or Spanish…) weren’t that astonished. Not at all. Sure, if your mental focus is Dauphiné / TdF, Dimension Data’s presence was notable, very concentrated and hence even more apparent. Take that away, and…? Not to speak about the absolute prevalence of *stages*. A single *victory* could also be a one-day race, why not?, be it a Classic or a semi-Classic, and it’s generally more worthy than the majority of “stages”: in most “stages” a bigger o smaller part of the field isn’t competing at all, whereas in a Classic, even in a minor one, nearly everybody is there to *compete*, going for the win, the break or helping the teammates. It’s not that Cannondale had a great season, they were pretty much petty in terms of victories, and that is no good, indeed, but they showed more consistency and depth, bringing home, among other things, *three final GT top tens* with three different riders. Sure, DD vs. Cannondale was kind of a yin-yang thing in terms of: racing only for the stages vs. racing mainly for the GC; or, victories (many of them smallish) vs. a lot of placements (some of them really big). It’s, like, perfect opposite. But cycling fans who actually watch races and not victory stats might appreciate quite a lot the fact of being in the mix in true Classics like Lombardia (two rider in top 5), San Sebastián, GP Plouay, Milano-Torino (two riders on the podium), Giro dell’Emilia (podium and top ten), Brabantse Pijl, Tre Valli Varesine, Giro del Piemonte, GP Montreal & Quebec. Note that in the Classics they weren’t scraping points in newly created races, the least prestigious were the Canadian ones which are actually quite good and can be considered sort of modern Classics. Personally, I’d consider most of those performances superior to a single *sprint* victory at the Tour. Cav did great because he gathered a whole lot of them – yet, a single sprint victory isn’t worth a hard Classics podium. At least IMHO, but I suspect that most Flemish/Spanish/Italian fans would agree. Dunno about the French, how far might chauvinism get. On a different level, it must also be noted that Cannondale did their homework great in collecting GC placings in one-week stage races, both in terms of quantity and quality. Personally I wouldn’t reward with points a GC placement beyond 5th, in short stage races… yet, it shouldn’t be overlooked when you’re making the final GC top-ten in each and every one of the following: Tour de Suisse, País Vasco, Dauphiné, Volta a Catalunya, Down Under, Tour de Pologne, California, Criterium Internationale, Utah. Winning is hugely better than placing, but no Oman, Qatar, Langkawi, Norway, Britain victory is worth a good showing in some of the above (the first four, to say the least). Neither Cannondale nor DD impressed me, but my impression is that DD didn’t deserve much more, nor Cannondale much less (I believe that Pologne rewarded them way too much, but the rest is more or less fine). I’ve done statistical pieces to show the correlation between wins and UCI rankings before. The short version is you can almost top the rankings with just one win at the Tour de France and a few placings elsewhere while racking up lots of stage wins wins in the Tour of [French region] and Vuelta a [Spanish region] doesn’t bring big points. But all these rankings are just arithmetic exercises, each team will have their own goals which usually means media attention. Some have to be seen winning while others are happy to be seen trying, the Cervélo Test Team of a few years ago was probably the best example of this with their videos as they were trying to reach fans rather than the mass-market TV audience. This in itself shows how worthless the UCI’s points system is. I believe in the 90s there used to be a special jersey for the leader/past winner of the yearly competition? Short answer, winners of the TDF, world champs, monuments get feted and remembered, the only time WT points are even mentioned in the cycling media is when there’s a potential relegation as happened last year or a small article at the end of the season noting that once again Valverde had ended up on top. Good news from the new teams. Bahrain and UAE stroke victories too, the debuting Italian teams with a Gulf name started with the right foot.